I love to start holidays at school with a word search! Most kids enjoy doing them, and it’s a fun, easy way for students to look at related terms and try to connect them to the person or event. Once students have completed the puzzle, use the terms for a quick discussion of the subject. This is a great method for reviewing or providing background knowledge for kids of all ages! 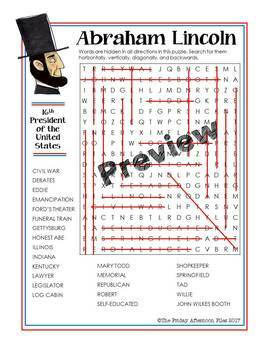 DIRECTIONS: Words are hidden in all directions in this puzzle about Abraham Lincoln. Search for them horizontally, vertically, diagonally, and even backwards. Test your knowledge about Honest Abe as you search for the terms associated with his life!